This is salsa fresca, my way. You know what makes it my way? It was made with fresh vegetables and herbs straight from my garden. That's right. I grew the tomatoes, the jalapenos, the banana peppers, the parsley and the oregano. Tooting my own horn here. Shamelessly, I might add. This is my very first season with a vegetable garden and things have been growing smashingly. I couldn't be happier about it! I mean, just look at those bright, beautiful colors. I swear, I have tasted few things that taste better than organically grown produce that came from my back yard. Most gratifying hobby ever. I'm getting in touch with my inner farmer and reaping the rewards. This girl's black thumb is looking a little greener! I'll be making this fresh, cool, crisp deliciousness with my garden's bounty all summer long! Combine all of the ingredients in a large bowl. Stir until mixed well. Cover and refrigerate for at least 30 minutes to let flavors mingle. Fresh cilantro can be added or substituted for one of the other herbs. I used what I had growing in my garden! 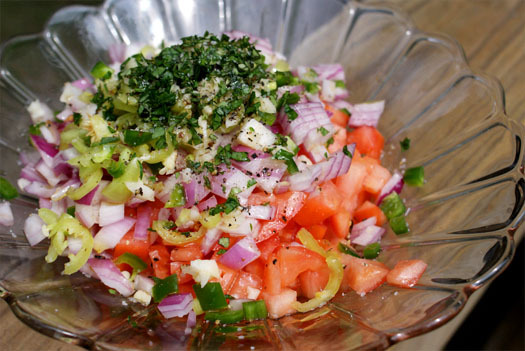 Serve this salsa with tacos, tortilla chips, or as a bruschetta topping.